Leasing Available from $41.15 per month! 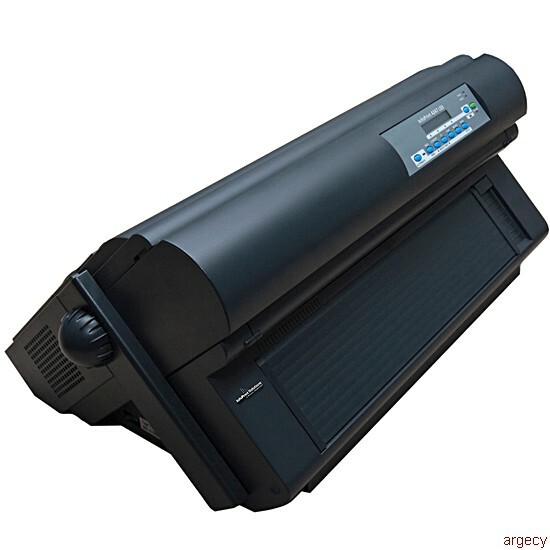 The IBM InfoPrint 4247 Model L03 is a professional industrial impact matrix printer capable of printing at speeds of up to 600 cps in Fast Draft mode.1 Other print-quality choices are Best Draft mode, Near Letter Quality mode (NLQ), and Letter Quality (LQ). The Model L03 is an office and industrial printer that provides multiple forms paper handling capabilities on up to 8-part forms. It is designed to meet low- to mid-volume output requirements and to provide reliable supply chain printing at an attractive total cost of ownership. A low-cost alternative to laser technology, the InfoPrint 4247-L03 can deliver broad forms flexibility, support for wide format printing, and the convenience of remote printer management when LAN attached. The Model L03 can have either one or two straight continuous-forms paper paths for outstanding paper-feeding reliability. One paper path is standard and the second path is an optional feature. The printer features quiet operation, and an easy-to-use operator panel. Typical applications include transaction processing for invoices, office or internal business documents, as well as bar codes, labels, and multipart forms. 1 Exact print speed varies depending on document complexity, system configuration, software application, the printer driver, and the printer state. The InfoPrint 4247 Model L03 Printer provides an entry-level model and is designed to complement the other models of the IBM 4247 family. The 4247-L03 is an office and industrial printer with a workload capacity of up to 44,000 pages per month. The 24-wire print head provides reliable printing on up to 8-part forms. The InfoPrint 4247 model L03 contains a multi-lingual LCD display and an intuitive, easy-to-use operator panel. The optional pedestal printer stand (#4463, 4464) completes the solution with a matching stand that simplifies setup and location choices. In addition to the standard parallel attachment, USB 2.0, 10/100 BaseT Ethernet, and RS-232 serial are available as optional attachments. The IBM 4247 Model L03 base printer includes a Centronics 36 pin parallel port as standard. The maximum data rate is 100 Kbytes/sec, and the input buffer is up to 128 Kbytes. The serial attachment is used to attach an IBM 4247-L03 printer to host systems or personal computers via RS-232 9-pin. The serial port is from 300 to 38400 baud and has an input buffer up to 128 Kbytes with X on/X off flow control. The integrated Ethernet is 10/100 BaseT with an RJ-45 connector. It supports SNMP and on-board IP configuration while enabling the use of the remote printer management utility. Remote printer management software, which is included with the optional Ethernet control unit, streamlines setup and minimizes output interruptions. This software enables remote configuration of multiple printers via the user-friendly graphical interface, as well as proactive printer monitoring to provide real-time printer status. Monitor real-time printer status for all printers on the network via an easy-to-use graphical interface. Enable printers to proactively send printer alerts to the appropriate operator if and when attention is needed. Quickly and reliably configure multiple printers. Utilize a virtual operator panel to maintain complete control from a remote location. The IBM 4247 Printer provides exceptional forms-handling flexibility. The base printer includes one continuous-forms tractor path; a second continuous-forms front tractor paper path is optional. No rear tractor path is available. No cut-sheet paper path (as on the Model 003) is available. This dual front paper path capability allows for a single printer to perform work that formerly required two or more printers. Users can load different forms into each tractor path and then enable the path that corresponds to the desired print job. The second path may be used by simply tearing off and parking the paper from the first path. Printer setup profiles can be stored and retrieved to save time by switching instantly from one application to another. Up to four customizable profiles can be created, saved, and then recalled for use. Print bar codes, charts, logos, overlays, and more to increase the effectiveness of your documents. 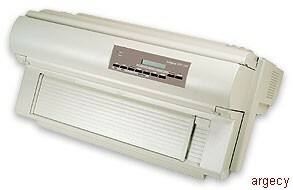 The IBM 4247 L-series ribbon provides excellent reliability and good print quality. A single ribbon is optimized for report, text, bar code labels, and Optical Character Recognition (OCR) printing. The following table summarizes the print quality for four print modes: Fast Draft, Best Draft, Near Letter Quality (NLQ), and Letter Quality (LQ). The data in the table is for 10 cpi for SBCS, and 6.7 cpi for DBCS. The table entries without the parenthesis are for SBCS; the table entry in parenthesis is for DBCS. For example, the fast draft horizontal DPI is 120 for SBCS and 60 for DBCS. A controller feature (#4350, 4352, 4360, 4362) or (#9300). Feature number 9300 indicates that no controller is required. A printer language kit (#9450, 9451, 9452, 9453, 9454, 9455, 9456, 9457, 9458, 9459, 9460, 9461, 9462, 9463, 9464, 9465, or 9466). A language kit must be included. There are no defaults. A line cord (#9970, 9971, 9973, 9972, 9974, 9975, 9976, 9251, 9350, 9979, 9978, 9354, 9997, or 9950). A line cord feature must be ordered. There are no defaults. Optionally, a printer stand (#4463) and/or an additional front tractor (#4004) may be ordered. Since the IBM 4247-L03 features are all customer-installable, in some cases it is desirable to bulk order certain features so that machines can be easily reconfigured by Business Partners and end users. Thus, there is no maximum order quantity for 4247-L03 MES features. The maximum number of initial-order attachment features that can be ordered is one. This feature provides a second 4-pin front continuous forms tractor path. This tractor feature is in addition to the standard continuous forms tractor paper path standard with the Model L03. Up to 8-part carbonless or 6-part carbon forms may be used in the front tractor path. Provides a sturdy printer stand designed for the IBM 4247 Model L03 printer. This feature provides a Single-Byte Character Set Controller with serial, parallel, and USB ports for host attachment. This feature provides a Single-Byte Character Set Controller with parallel and Ethernet 10/100 ports for host attachment. This feature provides a Controller with serial, parallel, and USB ports for host attachment. This controller supports both the Double-Byte Character Set and the Single-Byte Character Set characters and emulations. The Double-Byte Character Set support is Epson LQ1600K emulation with the GB18030 character set. This feature provides a Controller with parallel and Ethernet 10/100 BaseT ports for host attachment. This controller supports both the Double-Byte Character Set and Single-Byte Character Set characters and emulations. This feature specifies that no Controller is to be ordered with the base printer. This feature would normally only be ordered by Business Partners who have an inventory of control unit features that can be added to a base printer. This feature can only be used when a quantity of printers sufficient to fill a 20-foot ocean container is being ordered. Since this container holds 88 printers, this feature can only be used when an order is being placed for 88 or a multiple of 88 (for example 88, 176, 264) printers to a single destination. There is no additional charge for ocean shipping. This feature specifies that the 4247-L03 printer being ordered is to be shipped by air freight. This is a chargeable feature. The IBM InfoPrint 4247-L03 multiform printer is designed to meet low- to mid-volume output requirements. A low-cost alternative to laser technology, the InfoPrint 4247-L03 delivers high reliability from the office to the warehouse, along with broad forms flexibility, support for wide format printing, and the convenience of remote printer management. DPI is a registered trademark of International Business Machines Corporation in the United States or other countries or both. The following 4247 Model L03 publications are shipped with each printer. 1 This publication is on the CD in the following languages: English, French, Brazilian-Portuguese, German, Italian, Spanish, Danish, Dutch, Finnish, Norwegian, Swedish, Arabic, Chinese-Traditional, Chinese-Simplified, Czech, Hungarian, Polish, Russian, and Turkish. This CD can also be ordered using form number GK3T-9988. In DBCS: Epson LQ1600K emulation with the GB18030 character set. Note: Proportional spacing and italics printing are separate attributes and can be used at all cpi settings with each of the Single-Byte Character sets. This customer-replaceable cartridge ribbon supports general-purpose printing as well as automatic identification printing for visible light scanning. Warranty for all supplies is one year from the date of purchase stated on the purchase receipt. Material Safety Data Sheets (OSHA Form 20) for supplies with the IBM logo are available in the U.S. by calling 800-IBM-4333 (426-4333). You will need to provide the seven-digit part number or the machine model number, and supply type, for example IBM 4247-L03. Outside the U.S., contact your local supplier. Machine installation: Customer setup. Customers are responsible for installation according to the instructions IBM provides with the machine. Graduated program license charges apply: No. This product does not contain Licensed Internal Code or Licensed Machine Code. Infoprint is a registered trademark of International Business Machines Corporation in the United States or other countries or both.